Thanks to all who made 2018 conference a success! TPCH held the 2018 Making Homelessness History Conference Sept. 18 with support from nine agency sponsors: Diamond Sponsor Arizona Complete Health; Sapphire Sponsors ICS plus Intermountain Centers with Community Partners; Emerald Sponsors CBI, Inc. and Gospel Rescue Mission; plus, Opal Sponsors Compass Affordable Housing, Cope Community Services, and Our Family Services. TPCH extends many thanks to each sponsor, and will continue to acknowledge their support on our website here. Many thanks as well to Arizona Department of Housing Director Carol L. Ditmore for insights into statewide housing; the 25 subject matter experts who spoke during the breakout sessions; and the eight volunteers who helped ensure that sessions ran smoothly. Overall, more than 100 persons participated in the professional development and fundraising event. Preliminary estimates are that the conference raised more than $9,000 for TPCH to use in printing the Need Help? pamphlets and Guidelines on Getting Out as well as to help purchase gift cards to thank participants in the annual Point-In-Time unsheltered or Street Count. TODAY, Governance & Planning Committee, 8:30-10 am, Sullivan Jackson Employment Center, 400 E. 26th St. Emergency Solutions Subcommittee – Wed., Oct. 3, 10:30am-12 pm, Trinity Presbyterian Church, 400 E. University Blvd. 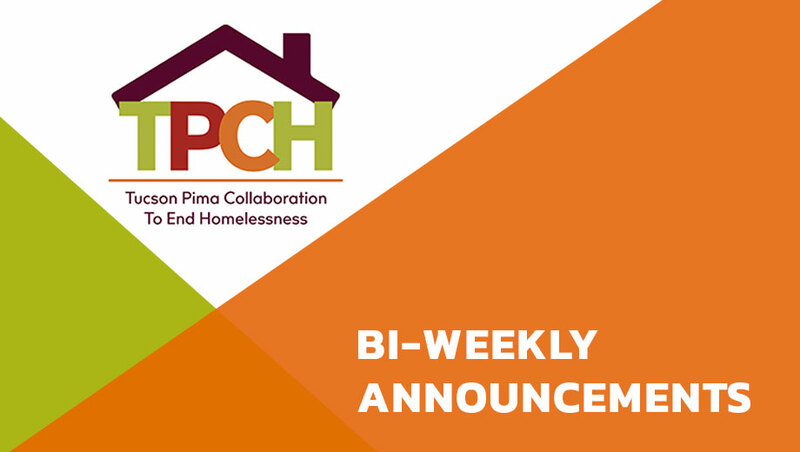 Coordinated Entry Committee – Thurs., Oct. 4, 1:30-3 pm, Pettit/Miles Room, Pima County Housing Center, 801 W. Congress St. Youth Action Committee – Thurs., Oct. 4, 5:30- 7 pm, Lohse Family YMCA, 60 W. Alameda St. 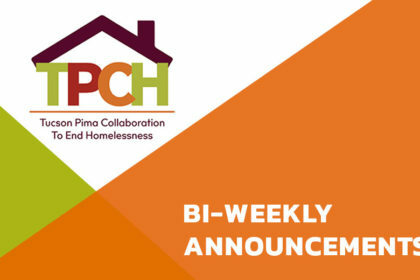 Homeless Youth Subcommittee – Fri., Oct. 5, 8:30-10 am, GAP Ministries, 2861 N. Flowing Wells Rd. HMIS Committee – Wed., Oct. 10, 3-4:30pm, Southern Arizona AIDS Foundation, 375 S. Euclid Ave. Coordinated Outreach Subcommittee – Thurs., Oct. 11, 9:30-10:30 am, American Red Cross, 2916 E. Broadway Blvd. Youth Action Committee – Thurs., Oct. 11, 5:30- 7 pm, Lohse Family YMCA, 60 W. Alameda St.
RAPP’s planned Oct. 1 move is delayed. Watch your email for the new date for moving to 1082 E. Ajo (rear entrance). In the interim, refer clients to RAPP at 1101 E. Broadway. Church, 400 E. University Blvd. nect.org and use the Contact Us link. Please see, print and distribute attached flyers. hungry, needy and under-represented community members is set Sat. Oct. 27, 9 am – 2 pm at the Center for Opportunity, 4550 S. Palo Verde Rd. To support the event a Pack the Parking Lot donation drive will be held Fri., Oct. 26 at the Center. For more visit www.hopefest.com.